would i just be better off finding a good used one, or making a decent one on my own? I think you can't go wrong with the GRS dual angle fixture. You don't have to use it on a power hone. You always get some stones and setup a nice level sharpening area Use the dual angle fixture in combo with any stones. The reason I like the dual angle fixture is you can play with your geometry to get tools that work for you. Whereas a template really limits you to what someone else thinks is good. With the dual angle you can literally make any graver. It just takes some research to learn how to make the various geometry types. I used this method for 30 years. It has been around for thousands of years. First you grind the tool to shape on a stone, grinder or beltsander, then get the face ground to 45-60 degrees on a stone by hand, then use a 1/8 in rod on a stone to do the belly. Maybe not the best, but the cheapest, and I still use it for 90 degree single points. Sam has the same thing on another thread here. take it from an broke newbie buy the GRS dual angle, You may think you can just buy some diamond stones and that you can just do it by hand. You might be able to get it good enough but not as good as you could and let me tell you there is a difference. Thanks for your photo, Barry. I added it to the Tips Archive. DiamondCactus: Good advice. One of the benefits of a sharpening fixture is consistency. When sharpening, a few degrees of change will change the behavior of a graver. 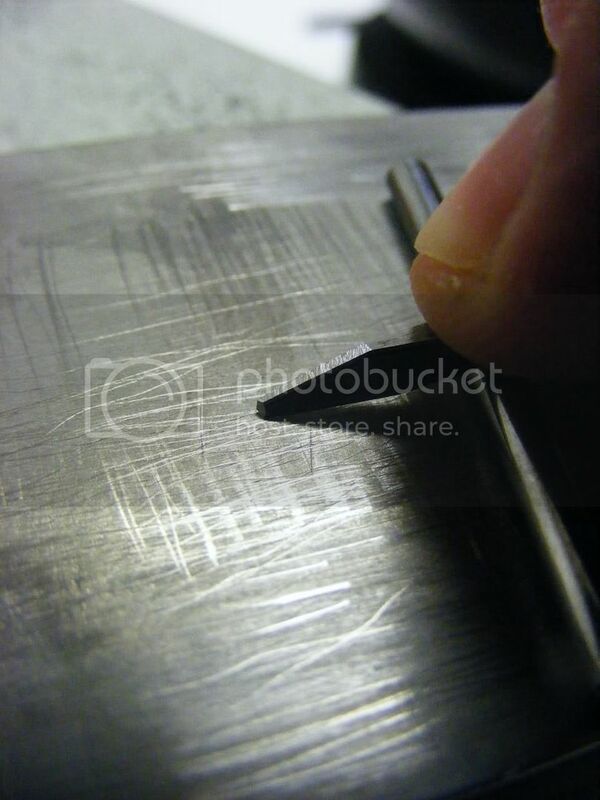 An experienced engraver can usually adapt to the change fairly quickly, but it can mean crash & burn for a beginner. But Barry's method and the one I posted in another thread work very well for accurate heeling. For the face I sharpened by hand without a guide, and yeah, it takes practice. i believe lynton mckenzie used a bolt and stone, much like barrys' method. later on he changed to a more modern method. this works well, but as sam mentioned-- consistency in your sharpening is a real priority. consistency can be acheived if you find a way to assure your graver protrudes the same exact distance from the bolt or rod. a simple guage could be made to assure the graver sticks out the same amount each time. a guide could be clamped on the back side of the graver, and would serve to limit the forward extension of the graver. SHOWN IS A 2X8" CERAMIC STONE. the protrusion length has been determined by a guage. the blue piece of plastic simply rides along the 1/4" dowel rod. it's clamped in place by a strong, mini spring clamp. ugly, but works !